Rich with the history of beach towns that existed along Pacific Coast Highway 101 prior to World War II, Encinitas remains one of the few unspoiled surf towns in Southern California where a casual, surf culture vibe peacefully coexists with the bustle of modern life. Just 22 miles north of San Diego, the coastal community enjoys a mild climate with an average rainfall of 10 inches and daily high temperatures in the 70s. The City of Encinitas incorporated in 1986, drawing together the unincorporated communities of Old and New Encinitas, Cardiff-by-the-Sea, Leucadia and Olivenhain. Old Encinitas is bike-and pedestrian-friendly with a train station that services both Amtrak and The Coaster commuter train. Old Encinitas combines an eclectic mix of boutiques and consignment stores, contemporary restaurants, taco shops and dive bars, meditation gardens and the occasional yoga studio. With six miles of beaches, Encinitas has a surf culture which drives a largely retail business environment, geared toward serving the needs of its 61,000 residents. Active families are attracted to its easy-going suburban neighborhoods and highly rated schools. The median annual household income is $87,074. 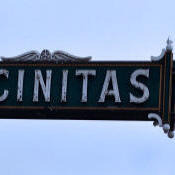 Encinitas was built around the growth of the flower industry. During the 1920s, polyethylene plastic made it possible to construct inexpensive greenhouses and air freight gave growers a national market. Paul Ecke developed the domestically grown poinsettia flower at Ecke Ranch, and by the 1950s the red flower was ubiquitous at Christmas. Encinitas is using the Main Street Program to revitalize its downtown areas. Nestled along iconic Coast Highway 101, this city of 61,000 is home to one of the best surfing spots in Southern California, a theater that showed the first film with sound in San Diego and the controversial “Surfing Madonna” mosaic. Five beach communities, each with its own distinct personality, make up Encinitas.